Error of confounding cause and effect.—There is no more dangerous error than confounding consequence with cause: I call it the intrinsic depravity of reason. … I take an example: everybody knows the book of the celebrated Comaro, in which he recommends his spare diet as a recipe for a long and happy life,—for a virtuous life also. Few books have been read so much… I believe hardly any book … has caused so much harm, has shortened so many lives, as this well-meant curiosity. The source of this mischief is in confounding consequence with cause. The candid Italian saw in his diet the cause of his long life, while the prerequisite to long life, the extraordinary slowness of the metabolic process, small consumption, was the cause of his spare diet. He was not at liberty to eat little or much; his frugality—was not of “free will;” he became sick when he ate more. From 'The Four Great Errors', The Twilight of the Idols (1888), collected in Thomas Common (trans. ), The Works of Friedrich Nietzsche (1896), Vol. 11, 139. As history proves abundantly, mathematical achievement, whatever its intrinsic worth, is the most enduring of all. In A Mathematician’s Apology (1940, 1967), 80. Christian Theology of Scientific Culture (1981), 63. In Vinoth Ramachandra, Subverting Global Myths: Theology and the Public Issues Shaping our World (2008), 187. Generality of points of view and of methods, precision and elegance in presentation, have become, since Lagrange, the common property of all who would lay claim to the rank of scientific mathematicians. And, even if this generality leads at times to abstruseness at the expense of intuition and applicability, so that general theorems are formulated which fail to apply to a single special case, if furthermore precision at times degenerates into a studied brevity which makes it more difficult to read an article than it was to write it; if, finally, elegance of form has well-nigh become in our day the criterion of the worth or worthlessness of a proposition,—yet are these conditions of the highest importance to a wholesome development, in that they keep the scientific material within the limits which are necessary both intrinsically and extrinsically if mathematics is not to spend itself in trivialities or smother in profusion. In Die Entwickdung der Mathematik in den letzten Jahrhunderten (1884), 14-15. Geology has its peculiar difficulties, from which all other sciences are exempt. Questions in chemistry may be settled in the laboratory by experiment. Mathematical and philosophical questions may be discussed, while the materials for discussion are ready furnished by our own intellectual reflections. Plants, animals and minerals, may be arranged in the museum, and all questions relating to their intrinsic principles may be discussed with facility. But the relative positions, the shades of difference, the peculiar complexions, whether continuous or in subordinate beds, are subjects of enquiry in settling the character of rocks, which can be judged of while they are in situ only. A Geological and Agricultural Survey of the District Adjoining the Erie Canal (1824), 8. Gradually, … the aspect of science as knowledge is being thrust into the background by the aspect of science as the power of manipulating nature. It is because science gives us the power of manipulating nature that it has more social importance than art. Science as the pursuit of truth is the equal, but not the superior, of art. Science as a technique, though it may have little intrinsic value, has a practical importance to which art cannot aspire. In The Scientific Outlook (1931, 2009), xxiv. If there be an order in which the human race has mastered its various kinds of knowledge, there will arise in every child an aptitude to acquire these kinds of knowledge in the same order. So that even were the order intrinsically indifferent, it would facilitate education to lead the individual mind through the steps traversed by the general mind. But the order is not intrinsically indifferent; and hence the fundamental reason why education should be a repetition of civilization in little. Education: Intellectual, Moral and Physical (1861), 76. In despair, I offer your readers their choice of the following definitions of entropy. My authorities are such books and journals as I have by me at the moment. (a) Entropy is that portion of the intrinsic energy of a system which cannot be converted into work by even a perfect heat engine.—Clausius. (b) Entropy is that portion of the intrinsic energy which can be converted into work by a perfect engine.—Maxwell, following Tait. (c) Entropy is that portion of the intrinsic energy which is not converted into work by our imperfect engines.—Swinburne. (d) Entropy (in a volume of gas) is that which remains constant when heat neither enters nor leaves the gas.—W. Robinson. (e) Entropy may be called the ‘thermal weight’, temperature being called the ‘thermal height.’—Ibid. (f) Entropy is one of the factors of heat, temperature being the other.—Engineering. I set up these bald statement as so many Aunt Sallys, for any one to shy at. In The Electrician (9 Jan 1903). In science, law is not a rule imposed from without, but an expression of an intrinsic process. The laws of the lawgiver are impotent beside the laws of human nature, as to his disillusion many a lawgiver has discovered. Attributed. Peter McDonald, In The Oxford Dictionary of Medical Quotations (2004), 2. It has become, in my view, a bit too trendy to regard the acceptance of death as something tantamount to intrinsic dignity. Of course I agree with the preacher of Ecclesiastes that there is a time to love and a time to die - and when my skein runs out I hope to face the end calmly and in my own way. For most situations, however, I prefer the more martial view that death is the ultimate enemy - and I find nothing reproachable in those who rage mightily against the dying of the light. Bully for Brontosaurus: Reflections on Natural History (1991). 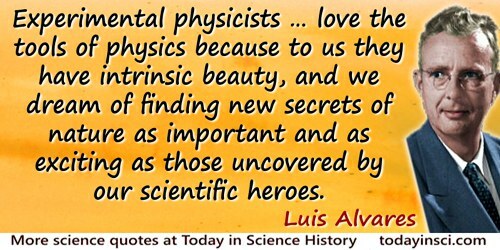 Most of us who become experimental physicists do so for two reasons; we love the tools of physics because to us they have intrinsic beauty, and we dream of finding new secrets of nature as important and as exciting as those uncovered by our scientific heroes. In Nobel Lecture (11 Dec 1968), 'Recent Developments in Particle Physics', collected in Nobel Lectures: Physics 1963-1970 (1972), 241. Of possible quadruple algebras the one that had seemed to him by far the most beautiful and remarkable was practically identical with quaternions, and that he thought it most interesting that a calculus which so strongly appealed to the human mind by its intrinsic beauty and symmetry should prove to be especially adapted to the study of natural phenomena. The mind of man and that of Nature’s God must work in the same channels. As quoted in W. E. Byerly (writing as a Professor Emeritus at Harvard University, but a former student at a Peirce lecture on Hamilton’s new calculus of quaternions), 'Benjamin Peirce: II. Reminiscences', The American Mathematical Monthly (Jan 1925), 32, No. 1, 6. Take the living human brain endowed with mind and thought. …. The physicist brings his tools and commences systematic exploration. All that he discovers is a collection of atoms and electrons and fields of force arranged in space and time, apparently similar to those found in inorganic objects. He may trace other physical characteristics, energy, temperature, entropy. None of these is identical with thought. … How can this collection of ordinary atoms be a thinking machine? … The Victorian physicist felt that he knew just what he was talking about when he used such terms as matter and atoms. … But now we realize that science has nothing to say as to the intrinsic nature of the atom. The physical atom is, like everything else in physics, a schedule of pointer readings. From a Gifford Lecture, University of Edinburgh (1927), published in 'Pointer Readings: Limits of Physical Knowledge', The Nature of the Physical World (1929), 258-259. The intrinsic character of mathematical research and knowledge is based essentially on three properties: first, on its conservative attitude towards the old truths and discoveries of mathematics; secondly, on its progressive mode of development, due to the incessant acquisition of new knowledge on the basis of the old; and thirdly, on its self-sufficiency and its consequent absolute independence. In Mathematical Essays and Recreations (1898), 87. The religious conservatives make an important point when they oppose presenting evolution in a manner that suggests it has been proved to be entirely determined by random, mechanistic events, but they are wrong to oppose the teaching of evolution itself. Its occurrence, on Earth and in the Universe, is by now indisputable. Not so its processes, however. In this, there is need for a nuanced approach, with evidence of creative ordering presented as intrinsic both to what we call matter and to the unfolding story, which includes randomness and natural selection. Epigraph, without citation, in Michael Dowd, Thank God for Evolution: How the Marriage of Science and Religion Will Transform Your Life and Our World (2008), 109. Quoted in Benjamin Franklin Finkel, Mathematical Association of America, The American Mathematical Monthly (1947), Vol. 54, 425. We have already considered with disfavour the possibility of the universe having been planned by a biologist or an engineer; from the intrinsic evidence of his creation, the Great Architect of the Universe now begins to appear as a pure mathematician. The Mysterious Universe (1930), 134. We must infer that a plant or animal of any species, is made up of special units, in all of which there dwells the intrinsic aptitude to aggregate into the form of that species: just as in the atoms of a salt, there dwells the intrinsic aptitude to crystallize in a particular way. In The Principles of Biology (1872), Vol. 1, 181.